Please click on any of the questions below to view the answers. We are thinking about gating our community. What is the first thing we should do? Are sliding or swinging gates better? What value does gating our community provide? Our old gate system gives us constant headaches. What can we do to upgrade and what are some of the new technologies? How do I select a good company for installing and maintaining gates? We have gates and our residents complain that non residents tailgate them through the gates to gain access to the property. How should we handle this? Request a city planner or fire department representative to inspect the property. Most are very cooperative. The inspector also can recommend companies you can call for a quote. For multifamily applications, sliding gates provide more access control and fewer incidents of forced entry. However, swinging gates have less maintenance on a daily basis and are more elegant. In most multifamily applications, residents readily accept a 1 percent to 2 percent rent increase for the installation of gates. This also will pay quickly for the new system. Private home subdivisions report 10 percent to 20 percent property value increases after installing gates. Upgrading some or all of the system’s components will help. Many times the gates and infrastructures are fine, but the controls are simply old and worn out. An upgrade can usually be done quickly and placed under warranty. State of the art gate operators and telephone entry control units will provide you with many years of service. Another new trend is adding radio control transmitters to a card or keypad control system. This allows convenience and can generate revenue from deposits/purchases or be a lease renewal incentive. You can reprogram the transmitters if one is lost or stolen; thereby maintain security on the property. Call other gated communities and get their recommendations. Also request information from gate companies to see how promptly and thoroughly they respond. As always, check with the Registrar of Contractors for proper licensing. Anti-tail gate arms (parking/barrier gates that drop right behind an authorized entry) help, but they frequently experience damage or breakage. Remember that the gates are for “limited access” only and may be breached. If a resident wants to reduce the chance of trespass, suggest that he or she stop just inside the gate and wait until it closes behind the resident’s vehicle. Your gate company can train you to fix minor problems and do a quick check of the system. With proper training, you can fix most problems. If you still need help, call the gate company. Some offer maintenance or extended warranty plans. Regular maintenance, such as greasing hinges and wheels, resetting operators and keeping the track clean, will help keep your gates performing the way they should. If you have any questions or comments, please call us at (602) 267-7778. 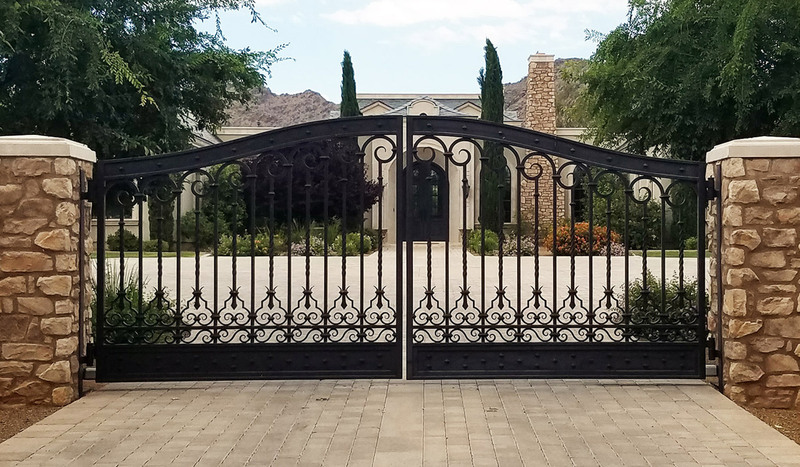 We have been Arizona’s premier source for the best quality, custom wrought iron and steel electric driveway gates and fences, serving businesses and residential property owners throughout communities including Phoenix, Chandler, Scottsdale, Gilbert, Peoria, Paradise Valley, Fountain Hills, Carefree, Cave Creek, Anthem, Mesa and Tempe. We also offer barrier gates, security gates, parking gates, revenue, turnstiles, automated swing gates, slide gates, telephone entry control, access control, cctv, dvr, cameras, parking gates, wrought iron, fencing, ornamental iron, chain link, aluminum gates and fencing, card readers, remote control, transmitters, keypad, cantilever gates and card readers.